These two cupboards used to be on the wall above where my boys are playing on our computer. I hated seeing them randomly placed, floating in space, and my husband could only see their functionality. 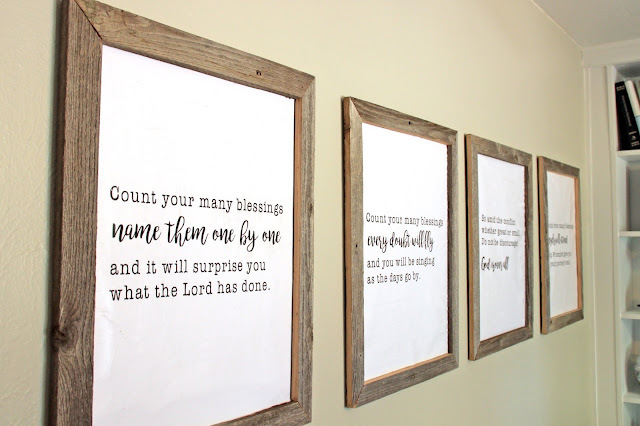 I put my foot down (somewhat brattily (I know, not a word, but you know what I mean)), and he helped me take them off the wall. I then had them just sitting there on the floor, not sure what I should do with them. Notice the primer patched wall? How could you not?! When we removed the popcorn ceilings and then went to re-texture the ceilings, we didn't tape off the walls (oops). The room had no doors or windows opened, and it got really, really, really muggy/humid. 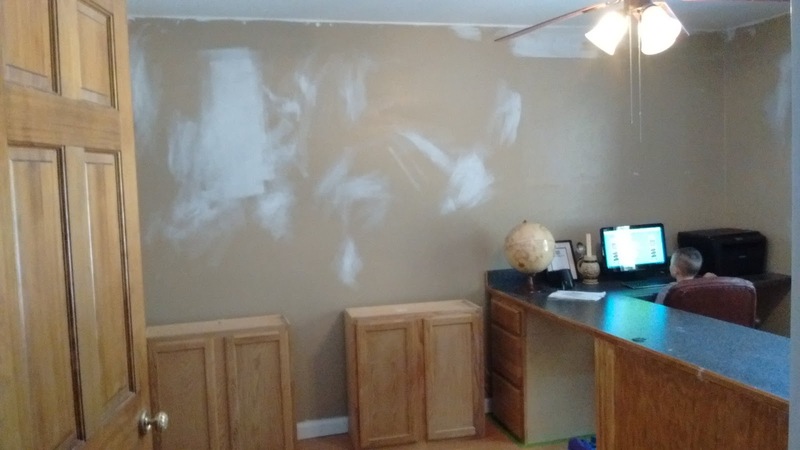 When going to wipe off the splatters of texture that landed on the walls, the brown top coat of paint just wiped off, and exposed the blue paint underneath. To prep it for a new coat of paint we just quickly painted primer patches over the "oops" areas. Needless to say, this room was on the top of my to-do list, yet was not an important (used much) room, so it got pushed back on the priority list. Finally I had had enough and told my husband, "I gotta tackle this room now. 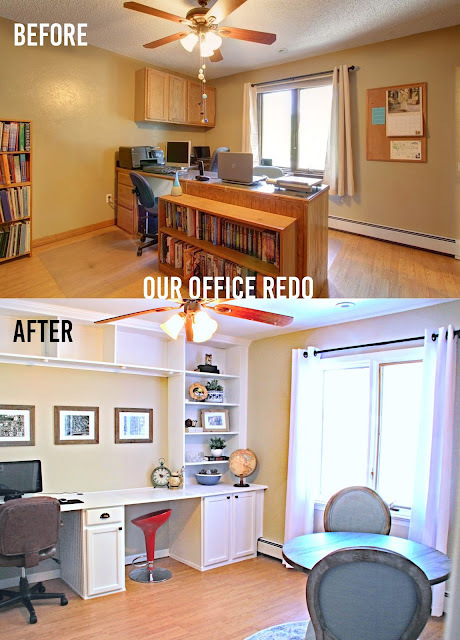 I don't just want to re-paint the walls, because I hate the built in desk the way it is, and want to do this room right from the get-go." He can tell when I am not open for discussion, and very lovingly let me have my way. In fact he knew he would have a hard time watching step by step of the process, and so we decided the room was off limits for him until it was finished. I didn't want the After to be part of it, but it does look more amazing side by side huh? Anyway, the room wasn't bad before we ruined it with the ceiling fiasco, but it wasn't really my style, and Pinterest just gives me too many ideas to be complacent. I ripped out the desk. I even had to bring in my circular saw to cut the desk in half so I could get it out of the room. Once a saw was brought inside the house, I knew there was no turning back. In the end I felt like built-ins all along the wall opposite of the door would be the best option. These design drawings really got my idea juices flowing. And helped me with the idea of having a workstation for two, and how to utilize the space on the wall. I love this link because it gave me the idea of having the built in on one wall, and in the room I could have a round table and chairs. Originally I wanted to have a stained work surface to give it a richer look like this example, but in the end couldn't figure out a good way to keep paint from the desk top, and stain from the surrounding shelves. 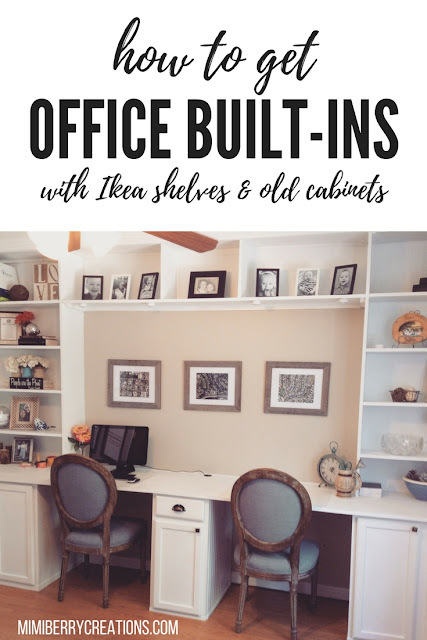 I did like that this source used Ikea Billy bookcases for their built-ins, and I knew this was a good route for a novice like myself who is not attentive to details. I liked this inspiration because it is just so pretty, and I love how fresh and natural everything looked. With a vision in mind, I went on Craigslist to find some bookcases. I settled on the Ikea Billy bookcases because they had the cleanest, simplest lines, and they sell extenders (shelves that are easily added on top of the bookcases) so that you can have shelves up to your ceiling. I found a pair of these bookcases only 15 minutes away for $80. Unfortunately they were not white, but I knew I would be painting everything so I didn't care. I didn't want to spend $40 for two extenders ($20 each), even though we live close to the biggest Ikea in the US, and found someone selling Ikea shelves that I cut to size and made my own with the help of my Kreg Jig. (I don't necessarily recommend this since my homemade ones are somewhat imperfect, but when you are cheap you go this route. $20 isn't a fortune, and it will be faster, easier and look nicer in the end then going my cheapskate route). 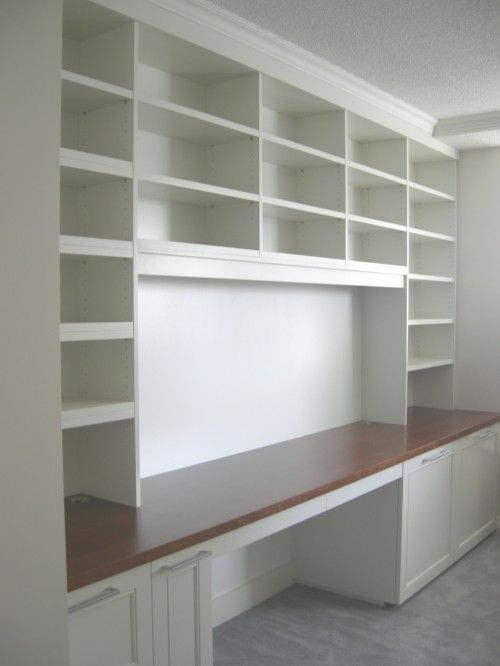 The built-in desk that was already in our home when we bought it, had several cabinets and cupboards. Based on the size of our room, and the depth of the soon to be desk (24" is an ideal depth FYI), I settled on 3 of the 5 we had. Since the two cupboards that I wanted to use on each side were only 12" deep, I had to figure out a way to make them match the depth of the middle cupboard I was going to use, which was 25" deep. This problem led to a solution, that made way for my mental vision to become a reality. This was a scary thought. If the bookcases had been in rough shape I wouldn't have hesitated to cut them in half with my circular saw. But they were in great shape and I felt bad cutting them. However I had a depth problem that needed solving, and I knew I wanted the bookshelves above a long desk. So I measured the height of the cupboards/cabinet, which was 30", and I drew a line around the bookcases, and used my saw and cut them in half. I then placed the bottom half behind the two cupboards to make the depth now match the cabinet that was going to separate the desk section, (you can see this in the picture that is further down the post). Home Depot is my favorite place since they always have plenty of workers happy to help cut a large 4' x 8' sheet of plywood to more transportable sizes. I meant to purchase 3/4" plywood, but I ended up with only 1/2". (I swear the sign above the pieces I picked said 3/4" but I realized this discrepancy too late). Our room's width is 152" and so I needed two sheets of plywood, and had them cut them to the depth I wanted (26"). Make sure to choose plywood that is triple sanded and not bowed so that it will finish nicely. Place plywood on top of the cabinets. If your cabinets are flat up against your walls, lucky you. If yours are like mine you will need to cut some wood strips, and screw them into your walls, right below where your desk will sit. These will support your desk. Also, we have baseboard heaters that we had to build around. To create a balanced look, I had the cabinets on the opposite wall the same distance away from the wall as the ones by the baseboard heaters. 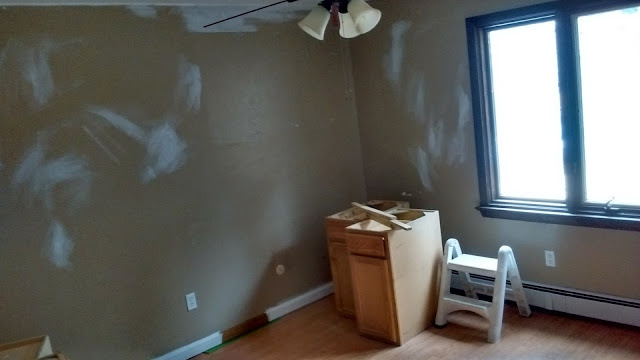 I screwed wood strips to the walls, right inside where I would attach plywood to create the appearance that the cabinets had wood extending from them to the wall. You can barely see these wood strips in the picture below, but I screwed them in all along the bookcases, and the walls opposite. 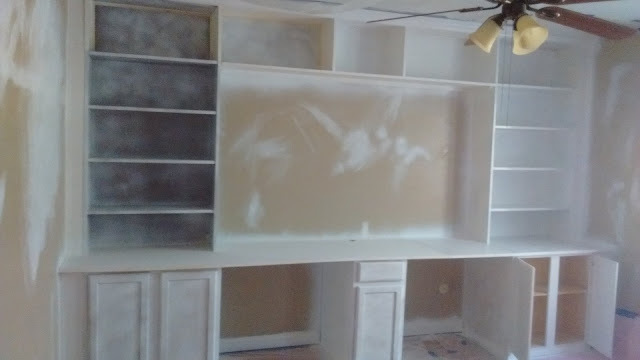 Plus I did the same on the outside of the cabinets, and the walls opposite of them. You need to measure the width of your plywood, and measure to where it would be flush with the rest of the built-in. Mark that line on your wall, and subtract the width of the plywood. Draw a new line and screw in your wood strips so they run along this inside line. Then you can nail the plywood piece to this wood strip. Here is where I was at at this point. You can kind of see the wood strips I mentioned, prior to the plywood sides being added. You also can kind of see the Ikea makeshift shelf extenders on top of the Billy Bookcases. 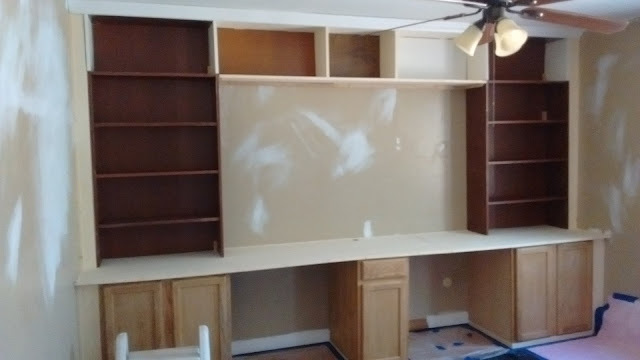 Lastly, you can see the base of the bookcase behind the cupboards. I had not placed the tops of the bookcases properly yet since I was screwing in wood strips to each bookcase and wall. 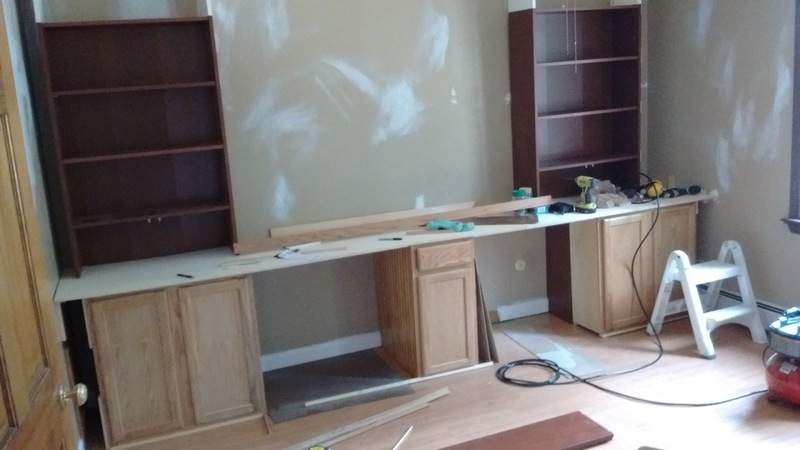 First make sure that the cabinets are all level with another (so the desk could be level), and used shims where they differed. Once everything was level, I screwed the cabinets into the ground using two screws each. I then used my nail gun and finish nails, and nailed the plywood onto the cabinets. To make it so the Ikea bookcases don't budge, first use the bracket on the top of each unit, and screw into your wall. I also made small wood blocks that I then put two screws in...one screwed into the bookcase itself, and the other into the wall. I placed a few sporadically in corners of the bookcases and found that these supports made the bookcases immovable. Because I had used only 1/2" plywood, I cut thin pieces of oak to span underneath the desk areas, and used my kreg jig to screw these into the cabinets on either side. I then used my nail gun and nailed the desk down onto these supports. Lastly, my interior decorator sister said that I needed shelves to bridge the gap between the two bookcases, and make them truly look like they were built-ins. I knew she was right. I thought it would make my job harder, but in the end it actually made things easier. I made sure they were the same height of the shelves so they would blend in, and used my kreg jig to put it all together. I then screwed in a small wood border, along the wall underneath, and on the sides of the bookcases so that I could rest these new shelves on. I then screwed these shelves into the wall directly, and used the kreg jig to screw them into the sides of the bookcases. First, I cut some wood paneling to size that we had lying around, to cover up the bookcase base, and side of the cabinets/cupboards. Then I cut plywood to fit the sides from the bookcases to the wall. Lastly I chose to make my own trim and baseboards using 1x2 strips that were only $0.99 for an 8' strip. I set my table saw so that the wood cuts would only be around 1/4" thick and chose to cut some boards so they were wider, and others so they were narrower (depending on how I fed the 1x2 board into the saw). These perfectly finished off the look, and helped cover the gaps between the built-ins and the walls. I attached each of these strips using wood glue and my nailer. You can see the trim that is directly against the wall. Doesn't that look almost identical to the Ikea bookcase edge just to the left of it? Also you can see the holes from the kreg jig that I didn't quite fill in with caulk well enough. Lastly, there is a slight gap where the backing I added to my homemade extensions got pushed back when screwing into the wall. These were the biggest imperfections in the whole thing, and I will someday fix them when I feel like it. Here is also a picture of the trim along the back of the desk, as well as the one hole I cut with a hole saw (for $8 you can get these attachments for your screwdriver) and then put in a desk/plug thingy (not sure the official name for the black thing that fit nicely into the hole). I forgot to mention that the middle cabinet happened to be right in front of the outlet we would need to power all computers, etc. My husband suggested we cut a hole in the back of the cabinet and then feed the cords up through the hole. You can also see the baseboard since I decided I'd rather cut the cabinet to fit up against the wall vs. cut the baseboard off. I figure we are keeping these built-ins for good, but in case we decide to get rid of them, the baseboards will still be intact. 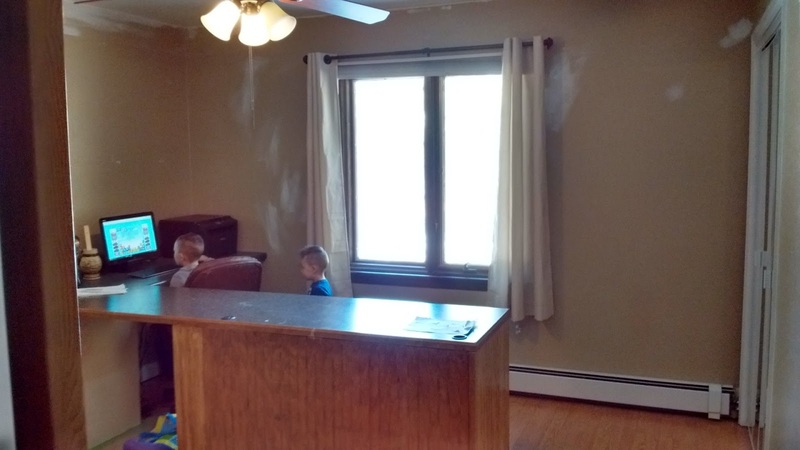 In this picture you can see the wood paneling has covered up the cabinet and bookcase base. Also you can see the homemade trim around the perimeter of the base. Lastly, you can see that the Ikea bookcase base had been trimmed so it could be up against the wall, and still keep the baseboard intact. Lastly, add the crown molding at the top of the built-in. I used to be intimidated by caulking, but I kind of love it now. I read a lot of reviews on caulk guns and settled on this one from Home Depot...not the cheapest and not the most expensive. For around $7 I got something that never fails me and works wonderfully. I just make sure I cut the caulk tube the size I want, and then follow along with my finger to smooth the caulk strips into the gaps. Caulk makes everything look professional, and hides so many imperfections. I also added caulk to any nail holes, etc. I tried caulking where the fake backing attached to the bookcases, but it didn't work well so I told myself it didn't matter :). Using my hand sander and 220 grit sandpaper, I sanded everything in the direction of the grain. The bookcases and cabinets needed sanding so the paint would adhere well, and I had to sand the plywood well so it was extra smooth. After cleaning all of the dust off, and cleaning out the room, I brought in my paint sprayer. Using the last of my Kilz primer, I sprayed everything with a fine coat. Unfortunately my primer was older and was too thick to work well in the sprayer, even though I majorly watered it down. I should've just gone to the store for more, but instead just got mad at my sprayer for not working well. After the wood has been primed it will get rough again. Using the 220 grit sandpaper, I lightly sanded off the raised peaks, and then cleaned off the dust. You will need to do this after you paint as well, but only slightly. I called around to Guiry's (who sells Benjamin Moore paints) and Sherwin William's, because I knew I wanted a more hard enamel finish then the one's I got from Home Depot. Even though Home Depot sells enamel paint that is water based, the finish still has a dominant latex finish to it that I didn't want, especially for a desk surface used by a family of 6. 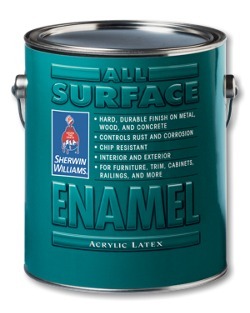 After doing some research and asking the paint pros, I settled on Sherwin William's All Surface Enamel in the satin finish. I chose SW7006, or Extra White, because that is the white we have painted all of our baseboards, as well as our fireplace. 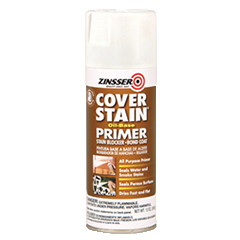 What I loved about using this paint was that it worked very well in my paint sprayer, and now it has hardened well and feels very smooth. I guess there is reason people go with these brands vs. Behr and Valspar. Even going into Sherwin William's and talking to their staff, the amount of knowledge and help they offer goes above and beyond. I am anxious to use this paint on bathroom and kitchen cabinets in the near future. I then added some knobs to each of the doors for a more finished look, and then let the paint cure for 3+ days. To fully cure it takes around 2 weeks (depending on your climate). I made sure to keep the drawer and cupboards opened so they could dry and harden well, and not stick closed. Once the paint no longer had any tackiness to it, I decorated everything with what we had around. This decorating is a major work in progress, but all in all the room feels complete. For the two work areas I bought desk mats from Ikea, which were only $5.99 each. This way when we write or work, we won't make indents in the wood, as well as it will be easier to keep clean. I've been really impressed with them so far. And that is it! It took me about two weeks to build everything, and then I decided to add these little LED lights that Costco was selling in a pack of 6 with a rebate for around $16. They are so cool because they easily stick wherever you want to put them, and can be used as touch lights or with a remote. The remote can dim them, set them on a timer, etc. So cool. When I surprised my husband, (when all the building was done,) these lights are what really excited him. Of course, the part of the project that anyone could do in 5 minutes was what he liked best. It's the little things people, the little touches that seem to matter I guess :). We then headed to World Market and bought a small round table and two chairs so that we could build puzzles, do homework, and visit at. (Table was just over $100, and the chairs were a little over $100 each). We bought the rug at Rugs USA for $54 (which seriously is the best place to buy rugs, since they are always having amazing deals that even beat out Ross's, and Home Good's prices, and they have a ton of reviews so you know what you are getting, and a TON of options). I wish we had bought the 8' rug instead of the 5' rug, but oh well, I don't want to deal with the hassle of returning it. And lastly I bought the pair of curtains from Overstock for around $20. I took wood from an old fence that I found on garbage day, and used my table saw to cut their width in half. Using my miter saw I mitered the edges, and then using my compressor and stapler, stapled the corners together. 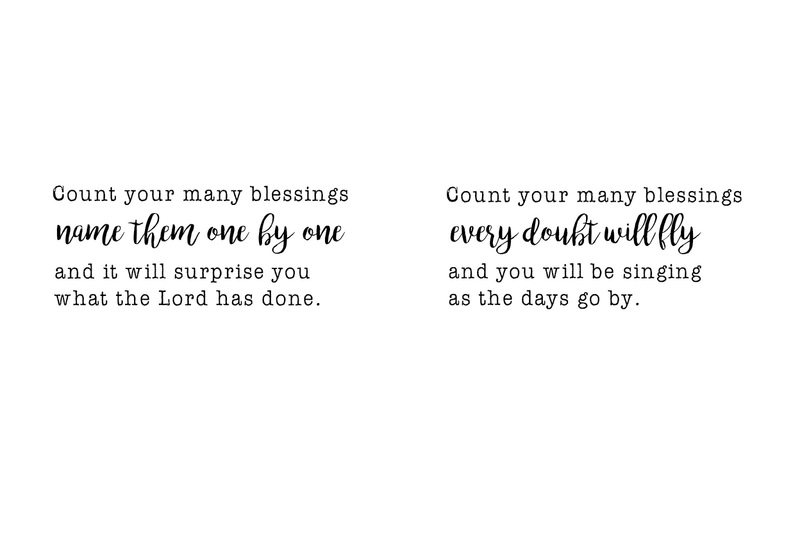 Using some lyrics from one of my favorite hymns, "Count Your Many Blessings", I made four prints that I sent over to Staples to print on their engineering print paper. You should be able to save them and then resize them as you see fit. I had four flat canvases laying around for years, and decided to print these two to an engineering print, then cut to the size of the canvas, and mod podge on. I found this just wrinkled the paper, so for better results, attach to a thin MDF or wood panel board using spray adhesive. I then took my power stapler, and with the frames and canvas upside down, stapled the canvas to the frame. I then attached picture hanging hardware to the back of each and voila! 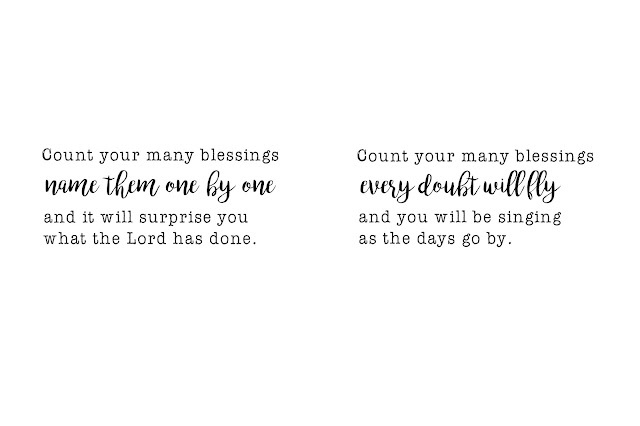 Cheap, inspirational art. So there you have it, a big project all wrapped up. I forgot to mention that we painted the room in Benjamin Moore's Revere Pewter (eggshell finish). I did use Behr paint color matched for this, and am happy with it. 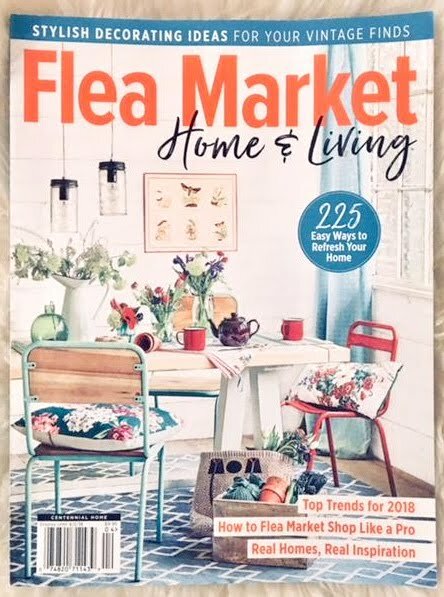 Crazy that the table, chairs and rug came to more than the built-ins, but I figure World Market does a better job at building those things then I can, so the cost was worth it. So what do you think? 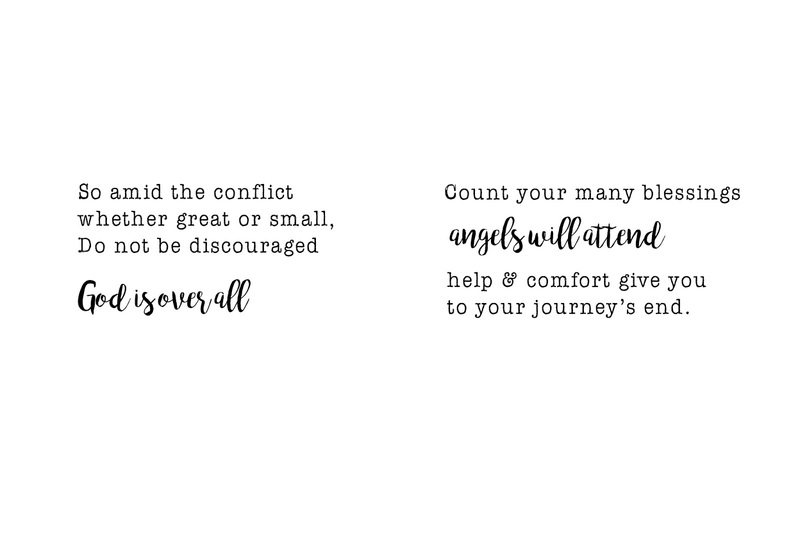 Do you feel empowered that you can take on this project too? The biggest thing I had ever built leading up to this was this little corner TV stand. I know that this tutorial has a ton of gaps in the explanation, but please feel free to comment below with any questions you have and I am happy to provide way more details! 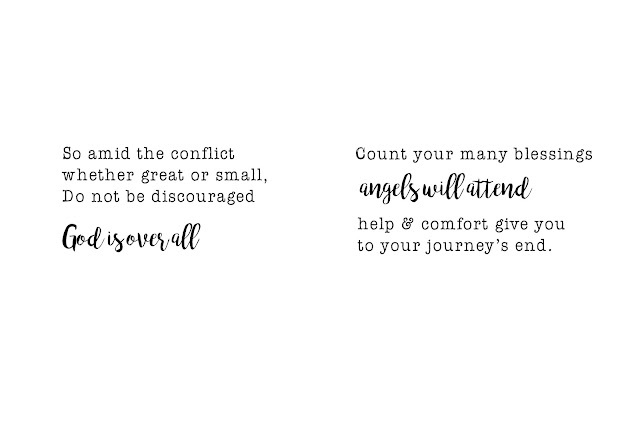 Hope you feel a little inspired to tackle something that has seemed daunting to you! It gave me the courage to start figuring out how to build a playhouse/treehouse for our boys!